All the amazing people! I couldn't believe how many people were A.) in the race and B.) along the route cheering. I especially appreciated the people that read my name off my bib and yelled it out. I have never smiled so much on a run, or possibly in a 2.5 hour period in my life! Someone else's grandma holding a sign that said, "Go Carly!" The nostalgia of running through my alma mater and a place that I spent 6 years of my life. My playlist on shuffle was amazing. I was nervous that I hadn't crafted the songs in a particular order, but it worked out so well! Some of the highlights were "Crazy For You" by Best Coast, "Power" by Kanye West, "Debaser" by the Pixies, and "Please, Baby, Please" by David Bazan (which came on in a particularly picturesque part of Urbana). The variety worked out so well that I didn't have to skip any songs, which is a pain to do on my touch screen phone in an armband. Running behind the guy wearing an "Ann Arbor is a Whore" shirt. Ah, the sweet Illinois hate of Michigan. Running past my old dorm - F.A.R. Crossing the finish line on the 50 yard line of Memorial Stadium at 2:09:03, which reached my goal of finishing under 2:10. Totally inspiring. Miles 10 and 11 were rough! It was getting warmer outside. I started to get in my head about how much time was left and I started zoning in on my legs starting to ache. The pain in my foot that has been creeping up for weeks...not sure what that's all about. My gps for the mapmyrun app on my phone was slightly off from the mile markers so it would tell me I was at mile 7 about 2 minutes before I would actually reach it...which was kind of cool and kind of annoying. The newer development in Urbana where every house on the block looked the same. Boring! Messing up my laps on my watch by pressing start 3 times after mile 8. I had forgotten that it freezes your time on the screen for you....oops. While I just had the pleasure of seeing them today, the race pictures that they are so kind to coordinate a link especially for you based on your bib number are definitely a lowlight. I do not need to see myself in motion, face contorted. As you can see, the highlights far outweigh the lowlights. I couldn't have done it without my biggest running cheerleaders and partners, MM and SB, and of course my partner in crime for dealing with the 7AM Saturday alarm clocks over the past 10+ weeks and being unconditionally supportive. 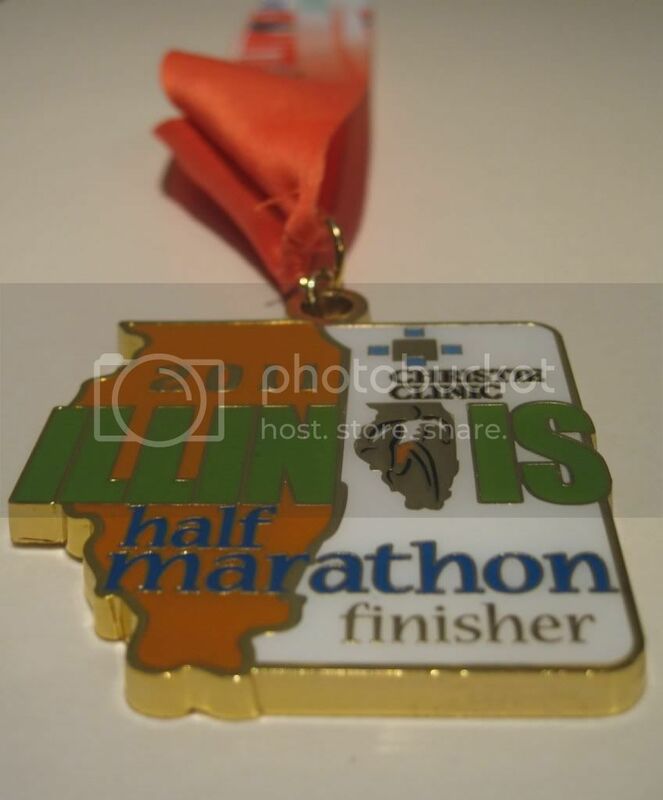 If you are contemplating a half marathon, 10K, 5K, or a jog around the block, I highly recommend it!